Conservationists rescued the five-year-old member of this critically endangered species from captivity in Borneo. Borneo Orangutan Survival FoundationThis five-year-old albino orangutan was recently rescued in Indonesia. A five-year-old orangutan has been rescued on the island of Borneo in Indonesia. And while all of the “critically endangered” Bornean orangutans are crucial to protect, this particular female is even more at risk. 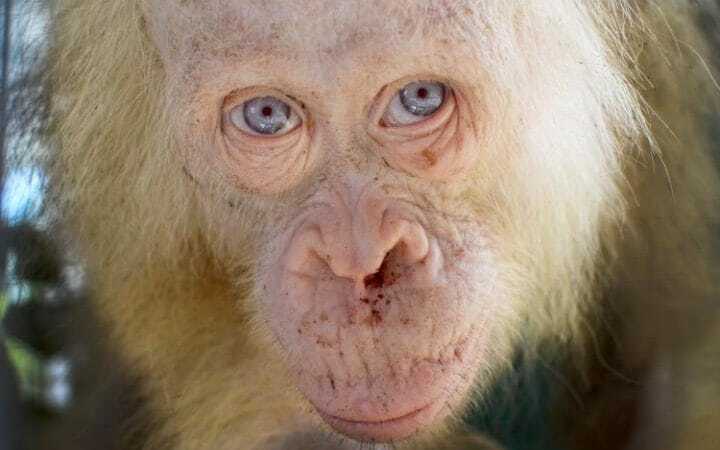 With white hair and strikingly light blue eyes, she’s one of only a handful of albino orangutans alive today. This ape was rescued from villagers last month by the Borneo Orangutan Survival Foundation. The villagers, according to an organization spokesperson, had kept the female in captivity for two days. She is now being kept in a dimly lit enclosure, due to her heightened sensitivity to the sun. “Understandably, she still has a long way to go in her recovery following the trauma of losing her mother and her illegal capture,” the group said, noting that they are unsure what happened to the mom. Borneo — which is divided between Indonesia, Malaysia, and Brunei — is one of only two places where wild orangutans can still be found. The population of the Bornean species experienced sharp declines in recent years, dropping more than 60 percent between 1950 and 2010, with a further 22 percent drop expected between 2010 and 2025. Scientists fear that by 2025, there will only be 47,000 members of the species left. 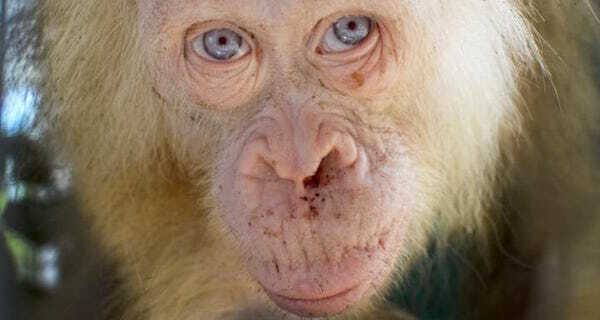 Conservationists involved in the albino ape’s rescue hope that her story will spread awareness about the plight of the species as a whole. They’re asking the public to pick a “meaningful” name for the female, who they hope to reintroduce to the wild as soon as possible. Name suggestions can be sent to [email protected], or by posting with the hashtag #albinoorangutan. The group will announce the winner on May 14. Hopefully this goes better than the last time that the internet was asked to name something — which resulted in Boaty McBoatface.